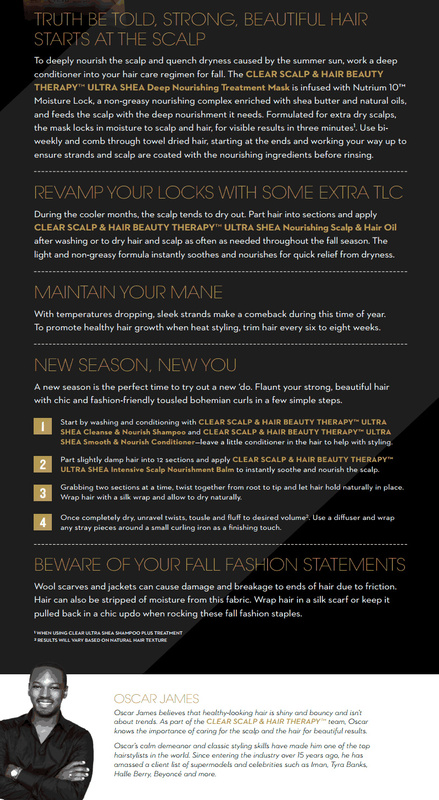 As fall weather is quickly approaching, I know many naturals are preparing not only their closets for the weather, but their hair. Cooler weather requires more attention to our natural tresses and many naturals will focus on increased moisture in hair as well as protective styles. 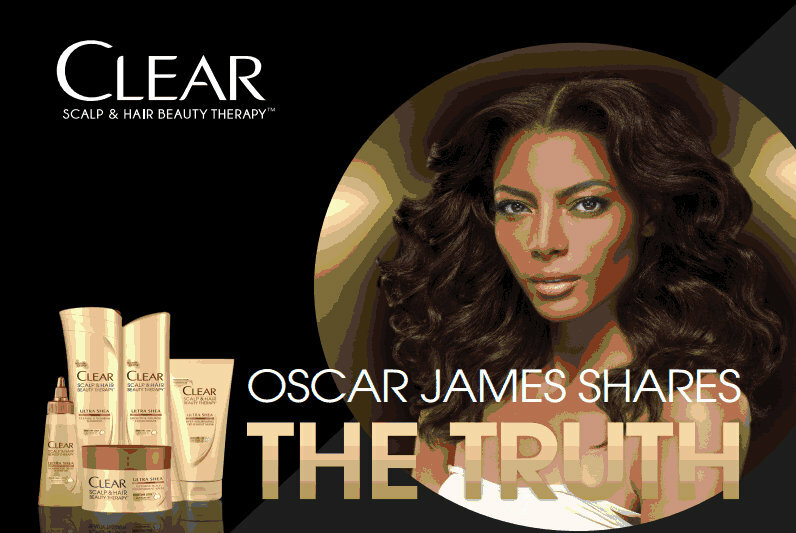 Today Clear Scalp & Hair Beauty Therapy Ultra Shea Celebrity Hair Stylist, Oscar James, is here to help you as well as myself produce healthier hair. I was able to interview Clear Scalp and Hair Beauty Therapy Ultra Shea Celebrity Hair Stylist, Oscar James, briefly and I asked five questions that myself and some of you were anxious to gain answers to. FabEllis: Although many women with natural hair enjoy sporting their natural tresses all year long, colder weather is a popular time for protective styles. What advice would you give for women before, during and after wearing a protective style? Oscar James: The scalp needs nourishment. I recommend products that nourish like CLEAR because it provides proper moisture. For protective styles, the best style are wigs because your hair can breathe at night. The second style would be a sew in with braids underneath and the third style is braids with human hair. With protective styles, I recommend leaving them installed no more than two and a half months, shampoo every one to two weeks and moisturize your scalp every two to three days. FabEllis: A common question for many women is how often they are supposed to trim their ends. For those who do not typically heat style their hair, do you still recommend trimming hair every six to eight weeks? FabEllis: One of my biggest issues since wearing my hair natural is that I have difficulty in seeing an actual shine to my hair. Although it may feel moisturized, it doesn't always appear shiny. Do you have any tips on ways for natural hair to appear shiny? Oscar James: It starts at the scalp. Using a good conditioner like Clear Smooth & Nourish Conditioner and Clear Nourishing Oil helps. FabEllis: What do you recommend for thinning edges? Oscar James: Most products are topical so I recommend seeing a dermatologist. FabEllis: Do you have any advice for growing hair? Oscar James: I recommend hair vitamins, drinking water and taking your time while detangling hair. Thank you again to Oscar James and Clear Scalp and Hair Therapy Ultra Shea for speaking with me and providing great hair tips! Did Oscar's tips help you? Awesome post, thanks for all the tips and information! Thanks Chantel! I'm so glad I got the opportunity. I appreciate you for reading!